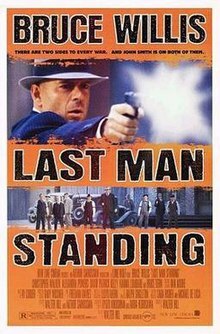 Last Man Standing is a 1996 American action film written and directed by Walter Hill and starring Bruce Willis, Christopher Walken, and Bruce Dern. It is a credited remake of Akira Kurosawa's Yojimbo. In 1932 Prohibition-era Texas, aimless wanderer John Smith (Bruce Willis) drives his Ford Model A Coupe into the small bordertown of Jericho. As he arrives, a young woman named Felina (Karina Lombard) crosses the street, catching Smith's eye. Moments later, a group of Irish mobsters, led by Finn (Patrick Kilpatrick), surround Smith's car. They warn him against staring at "Doyle's property" and puncture his tires, smash his windshield and shatter his headlamp. Following Finn's death, Fredo Strozzi (Ned Eisenberg), the head of Jericho's Italian gang, offers Smith a job in his outfit. Strozzi predicts a gang war between his and Doyle's gang, and is hiring as many skilled soldiers as he can. Smith accepts the job and sits down to dinner with the Strozzi gang where he meets Giorgio Carmonte (Michael Imperioli), son of a prominent Chicago mobster who is monitoring Strozzi's activities in Jericho. Carmonte expresses his distrust with Smith, who leaves the dinner, and meets and seduces Strozzi's mistress, Lucy (Alexandra Powers). Smith accompanies Strozzi and his men to a remote Texas road. Together with Ramirez, a corrupt Mexican police capitán providing security for Doyle, Strozzi ambushes and kills Doyle's men and seizes his entire liquor shipment. Following the ambush, Carmonte travels to Mexico to cut more deals with Ramirez. Meanwhile, Doyle (David Patrick Kelly) and his right-hand man, Hickey (Christopher Walken) return to Jericho and hear about the recent events, from Smith's arrival to Finn's death and the loss of their liquor shipment. Smith defects to the Doyle Gang and reveals to them Strozzi and Carmonte's bribery of Ramirez. Hickey travels to Mexico, where he kills Strozzi's and Ramirez's men, a corrupt U.S Border Patrol officer, and kidnaps Carmonte. Doyle contacts Strozzi and demands a large ransom for Carmonte, as well as the return of his trucks. Strozzi in turn kidnaps Felina and offers an even trade, Felina for Carmonte. The two gangs make the exchange and return to their respective empires. Smith is summoned by Sheriff Galt and meets Captain Tom Pickett (Ken Jenkins) of the Texas Rangers, who is upset over the death of the Border Patrol officer. He warns Smith that he can tolerate one gang in Jericho, but not two. He says that in ten days he will bring a squad of 20 Texas Rangers to Jericho and if he finds more than one gang, will wipe them both out. Smith says he intends to play the gangs against each other, wiping them both out and making money in the process. Pickett leaves, emphasizing that, if he finds Smith here in ten days, he'll kill him as well. Lucy comes to Smith and reveals that Strozzi, angered after the exchange, beat her and had Giorgio cut her ear off when she revealed her affair with Smith. Smith gives her some money and puts her on a bus out of Jericho. The next day Smith relays a false rumor that Strozzi is bringing in more soldiers. Playing on Doyle's obsession with Felina, he makes Doyle afraid that Strozzi will try to kidnap her again, and Doyle orders Smith to go to the safehouse where Felina is being held. Smith kills the men guarding Felina. Felina reveals that her husband lost to Doyle on a game of poker and he kept her as a prize, and she goes to Mexico to return to her family, with Smith giving her one of Doyle's cars and some money. The next day, Smith is waiting at the safehouse when Doyle arrives, and claims that he arrived too late, Strozzi's men had already killed the guards and abducted Felina. Doyle's henchman Jack McCool (R. D. Call) believes Smith's story, while Hickey suspects that Smith killed the guards and freed Felina. Doyle goes berserk and declares all-out war on Strozzi and his gang. Smith's plan goes awry when Hickey and some of Doyle's men ambush Smith, with Hickey revealing that he had pieced together the truth by learning that Felina was not abducted by Strozzi and had sold her car in Mexico and took a bus to the South. Doyle imprisons Smith and has him tortured, demanding to know where Felina is. Despite the heavy torture inflicted on him, Smith refuses to talk. Later that night, he escapes by killing two of Doyle's men, and escapes town with the aid of Monday and Sheriff Galt. As they are driving out of town, they see Doyle's gang slaughtering Strozzi's gang at a roadhouse. After all of their men are killed by Doyle's men, Strozzi and Carmonte exit the roadhouse and try to surrender to a revenge-driven Doyle. Hickey shoots Strozzi to death, while Carmonte is killed by Doyle's men. Smith takes refuge at a remote church where Felina went to pray. Two days later, Sheriff Galt arrives and informs Smith that Monday was caught smuggling food and water to Smith and that Doyle will probably torture him to death. He then hands Smith his pistols and informs him that that is all the help Smith can expect from him. Smith returns to town and storms Strozzi's hotel, which is now Doyle's headquarters and kills all of Doyle's men, including McCool, and rescues Monday. Doyle and Hickey are absent, having gone down to Mexico in a desperate search for Felina. In the final scene, Doyle, Hickey and Deputy Bob confront Smith at the burned-out remains of Strozzi's hideout since Smith summoned them there. Doyle, still despondent over the loss of Felina, tells Smith they can be partners and begs him to reveal where to find her. Before he can get further, Monday shoots Doyle in the chest with a Wild-West era revolver, killing him for "ruining his town" and Smith shoots a shotgun-wielding Bob before he can retaliate. Hickey drops his submachine gun and says he doesn't want to die in Texas ("Chicago maybe") and starts to walk away, intending to actually kill Smith. With lightning speed he turns and quickdraws a pistol from his holster, but Smith is faster and shoots Hickey, killing him. Smith gets into his Ford (which was repaired by the mechanic) and drives on to Mexico, his original destination, leaving Monday some money and Doyle's car to return to Jericho. He reflects that he is as broke as he was when he first arrived, having given all the money he made off the two gangs to various women in order to get them out of town, including Felina and Lucy. However, he consoles himself that everyone in the two gangs is better off dead. Walter Hill was approached by producer Arthur Sarkassian to remake the Japanese film Yojimbo (1961), which Akira Kurosawa not only directed but also co-wrote with Ryūzō Kikushima. Hill says, "It took me a long time to be persuaded to do it. I thought the very idea of adapting Mr. Kurosawa was insanity for the obvious reasons. The first movie was very, very good and in addition I would be in the long shadow of Mr. Kurosawa who is probably our most revered filmmaker." When he learned that Kurosawa was supportive of an American remake, Hill agreed to write and direct—but on the condition that the film not be a Western (there was already an unauthorised European remake, the Spaghetti Western 'A Fistful of Dollars', which had been the subject of litigation). He decided to do it as a 1930s gangster film using techniques of 1940s film noir. "This is the story of a bad man, who as soon as he arrives begins pushing buttons and doing things only for himself," said Hill. "But we also discover that this man is at a point of spiritual crisis with himself and his own past. And this man decides that maybe he should do one good deed, even if it goes against all the rules of his life as he understands it ... The action and the violence must be organic to the story being told. I think this is obviously by its nature a very dark and very hard movie, so I think it would be dishonest to tell the story and present the physicality in a softer way. Besides, I don't think this is the most brutal film imaginable. There's actually very little blood other than in the sequence where Bruce gets beaten up." He admitted the film was not realistic. "I don't think anything akin to the social realism movies of the 1930s is being attempted," he said. "We're into a 'once upon a time' mythic- poetic situation." Hill signed to make the project in 1994. The film was green lit by New Line Cinema's head of production Michael De Luca who allocated a $40 million budget. The film was known by several titles including "Gundown," then "Gangster," then "Welcome to Jericho." Hill later said that he and Bruce Willis "were not close when we did the film" but "I liked working with him. It was impersonal. Classic, 'I know what you mean. You want me to be a Bogart, Mitchum kind of guy' and I said 'Exactly. Let it happen.' He then took that and gave what I thought was a very good performance. I always sensed there was a kind of core resentment that Bruce felt he should be more appreciated for his talents. At the same time I think there is a limitation, that he does certain things better than others, and he hasn't always chosen so wisely." Hill's original cut of the movie was over two hours long. Before Hill edited the final theatrical version his rough cut was used to edit the trailers for the movie, which is why there is lot of alternate/deleted footage shown in them, including many alternate takes, different edits of some scenes, extended versions of scenes, some extra lines of dialogue, shots and parts of deleted scenes including additional shootout sequence between two gangs and alternate ending in which Hickey is killed by Smith in a different way. Some promotional stills and pictures also show several deleted scenes. The film was a box office bomb, grossing only a total $18,127,448 domestically by December 22, 1996, and brought in only $47,267,001 worldwide. The film received mixed to negative critical reviews. It has a 37% approval rating on Rotten Tomatoes based on 30 reviews. Common recurring complaints address the oppressive and depressing atmosphere of the film; the flat, almost monotonous personality of Willis' character between gunfights; and the film's Pyrrhic victory finale. Audiences polled by CinemaScore gave the film an average grade of "C+" on an A+ to F scale. Last Man Standing is such a desperately cheerless film, so dry and laconic and wrung out, that you wonder if the filmmakers ever thought that in any way it could be ... fun. It contains elements that are often found in entertainments — things like guns, gangs and spectacular displays of death — but here they crouch on the screen and growl at the audience. Even the movie's hero is bad company. ... The victory at the end is downbeat, and there is an indifference to it. This is such a sad, lonely movie. ^ "Last Man Standing (1996) – Box Office Mojo". Box Office Mojo. Retrieved 15 August 2010. ^ "Google Translate". Translate.google.com.au. Retrieved 29 September 2017. ^ a b c Portman, Jamie (12 Sep 1996). "Filmmaker Walter Hill has made some of ...". CanWest News. p. 1. ^ Spike Lee to shoot from 3-point line: [City Edition] Carr, JayAuthor InformationView Profile. Boston Globe (pre-1997 Fulltext) [Boston, Mass] 31 July 1994: B19. ^ With Hollywood Money, Trust Someone Under 30: Hollywood Money and Someone Under 30 By BERNARD WEINRAUB. New York Times (1923-Current file) [New York, N.Y] 18 July 1995: C13. ^ "Walter Hill - Visual History Interview". Dga.org. Retrieved 29 September 2017. ^ "Last Man Standing". Rottentomatoes.com. Retrieved 29 September 2017. ^ Ebert, Roger (September 20, 1996). "Last Man Standing". RogerEbert.com. Retrieved October 6, 2017.